Add olive oil to a large pan over medium-high heat and add all the ground beef. Brown beef well. Meanwhile, pulse onions, celery, and carrots in a food processor or dice really well. Add veggies to ground beef. Cook until veggies are soft, another 5 minutes or so. Stir in tomato sauce, spices, and brown sugar. Add a pinch of salt and pepper and let simmer for 5 minutes until it starts to thicken. Set your sloppy joe mix aside for later! Cook elbow macaroni according to package. In a large pot, add butter and melt, then sprinkle in flour. Cook roux over medium heat until it turns a light brown color, about 3 minutes. Whisk it continuously. Very slowly whisk in milk into the roux. Work slowly or the roux will get lumpy. Once your milk is in, the mixture should be the consistency of a light gravy. If it isn't, simmer for a minute or two until it thickens. Once the mixture is thickened, stir in grated cheese until melted. Then stir in elbow macaroni. Butter an 8x8 casserole dish well. Pour sloppy joe mixture into bottom of pan. Then top with the macaroni and cheese. Tear up a few pieces of bread and sprinkle them all over the top of the casserole. Bake casserole at 350°F for 30 minutes. Allow to cool for a few minutes before serving. Do you know what a music mash-up is? It’s when a talented DJ takes two songs that seem worlds apart and mixes them together into a seamless creation. Well, this is my comfort food mash-up. It takes two of my favorite dinners from childhood (sloppy joes and macaroni and cheese) and mashes them together into one delicious dish. And trust me. 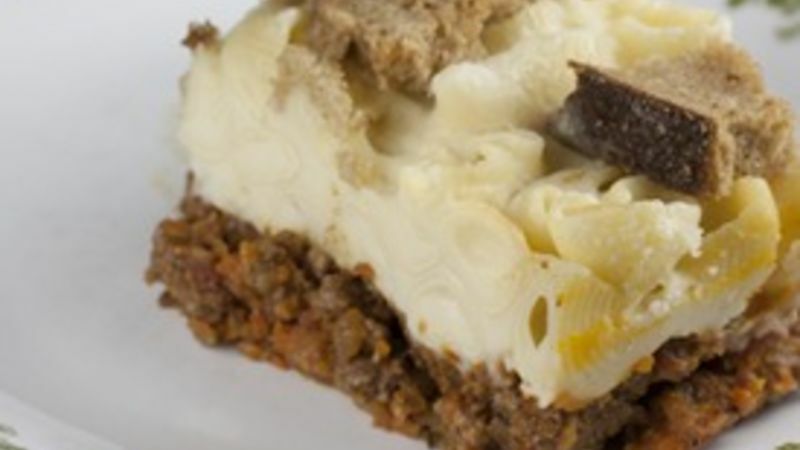 Sloppy Joe Mac and Cheese is a mash-up that you’re going to try out. Of course, there are two crucial parts to this dish and I really recommend taking the time to make them both from scratch. It takes about 20-30 minutes total and really makes the dish something special. I like to start with the sloppy joe part because it will keep better while you make the macaroni. Start by pulsing up your carrots, celery, and onion in a food processor until they are nicely chopped. If you don’t have a food processor, you can just mince them finely. In a large pan, add a drizzle of olive oil and all of the ground beef. Crank the heat up to medium-high and cook the beef until it’s nicely browned. Once the meat is browned, add in the veggies and a pinch of salt. Cook this for another 4-5 minutes until the veggies start to soften a bit, then add in some tomato sauce (I used Muir Glenn organic) along with the brown sugar, Worcestershire sauce, red wine vinegar, and spices. Let this all simmer together for a minute or two and your sloppy joe mix is done! On to the macaroni and cheese! I like to use elbow macaroni for my mac and cheese just because I’m a traditionalist. You could use any kind of tubular pasta though. Just cook the pasta according to the package and set it aside. The real key to a good macaroni and cheese is in the cheese sauce. No surprises there, I’m sure. And the key to cheese sauce is a good roux. If you don’t know what a roux is, it’s just a combination of butter and flour that you cook on medium heat for a few minutes. It will turn into a light brown paste as you whisk it (and you should be whisking it). This stuff will thicken almost anything. When your roux is ready, it’ll look something like this. It should also go without saying that you’ll need a good amount of cheese for this. About 8 ounces should do the trick, but you could do even more if you wanted. I like to use Monterey Jack for my mac and cheese because it melts really well, but feel free to use cheddar or something else. Grate your cheese and have it ready. Once your roux is a light brown color, slowly start whisking in your milk. Add it about a quarter cup at a time and whisk furiously. The mixture will steam and hiss at you which is fine. If you add the milk too quickly, your roux will be really lumpy – which is no good. So add the milk slowly and whisk, whisk, whisk. Eventually, you’ll have a nice smooth sauce with the consistency of a light gravy. If it seems too runny, just stir it over medium heat for a few minutes and it’ll thicken up. I promise. Then you can add it all your cheese and stir it until it’s melted. Stir in your macaroni and you’re in business. The most important thing about assembling this dish is to make sure and rub butter or oil all over the baking dish so the macaroni doesn’t stick to it. Then add all the sloppy joe mix to the bottom of the pan. Scoop the macaroni and cheese on top next. It should completely fill the dish. As a final touch, I like to rip up some bread (or hamburger buns) and add those on top. They will crisp up nicely in the oven and give the dish some texture. Toss this thing in the oven for 30 minutes at 350 degrees and then let it cool for a minute or two before serving it. Your people will be in for a treat! Of course, if you were in a rush or didn’t feel confident in your cooking abilities, you could use a few shortcuts like boxed mac and cheese for this dish, but the real payoff comes with the homemade versions. Give this comfort food mash-up a shot! Nick considers himself to be an expert of the cuisine mashup. Check out his blog Macheesmo and Tablespoon profile for more examples!